Peterhead look to have put their slow start to the season firmly behind them after winning their third game in a row at home to Stranraer. Rory Mcallister and Scott Brwon’s second half goals were enough to secure all three points for The Blue Toon as Brian Reid’s side struggled after the dismissal of Willie Gibson in the 53rd minute. 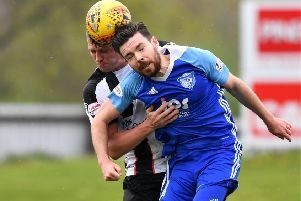 At the start of the month, Peterhead found themselves propping up the table from bottom spot but now Jim McInally’s team have climbed up to sixth spot and find themselves just one point off the play-off positions. Speaking after the match, McInally praised the efforts of his players, particularly Stefan McLuskey and goal scorer Scott Brown. He said: “I was delighted for Stefan as he hasn’t had many breaks since joining the club the one thing about him is that he works tirelessly and it was a great ball for Rory to score from and even the chance for Jordan that the keeper saved. “I’m delighted for Scott Brown, he’s a bit of an unsung hero and to score after running half the length of the pitch was terrific and he is one that has gone to the top of the list of players I like, he’s a good player. “We needed the second goal but just delighted to get it and we could relax a bit. “The way we started the game we could have been three up in the first ten minutes and when you don’t take chances like that you fear the worst and think it might be one of those days. “For 30 minutes we played well then they came into the game and had a strangle hold on us and Willie Gibson was sparking off good moves. Next up for Peterhead will be a home tie this weekend against second placed Brechin at Balmoor. The Hedge Men have been in fine form this season but surrendered top spot in the table to Livingston at the weekend following a 3-0 defeat to the new table toppers.